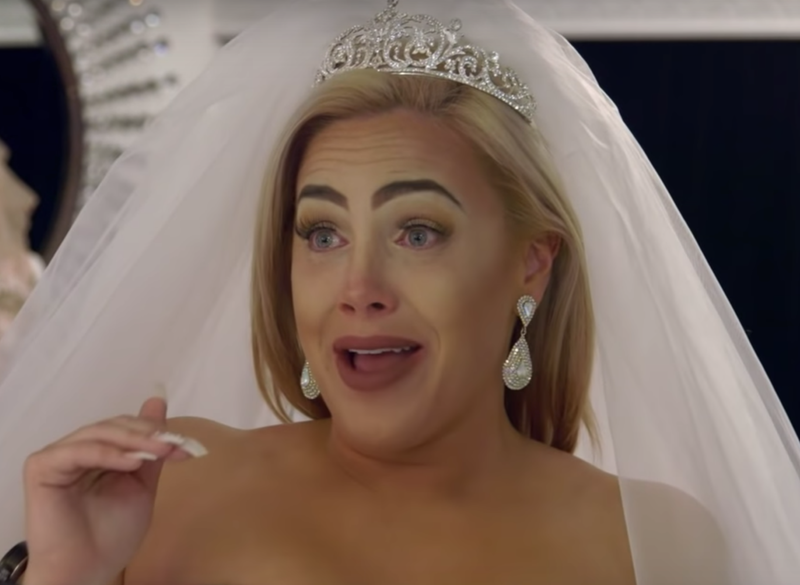 Bridezillas is back with a vengeance as it enters Season 12, and with the lead up of two brides’s big days being unveiled. The WE reality series introduces its newest bridezillas—Shannon Sarich and Jaslyn Williams—in Friday’s episode. Sarich, 32, is a self-proclaimed TV celebrity. She has appeared on Oxygen’s Bad Girls Club in Season 10 and Season 13. She also appeared on Bad Girls All-Star Battle. She boasts 141,981 Instagram followers and 81,000 Twitter followers. On Bridezillas, she’s set to tie the knot with 37-year-old Patrick McGowan. In a preview for Friday’s episode, Sarich is shown trying on her wedding dress for the first time. While the dress—which is actually a quinceañera gown—proves to be a good fit, it comes at a price. Her chosen dress amounts to $7,000 and exceeds the rest of the wedding budget by $2,000. McGowan called one of Sarich’s bridesmaids for an update on the wedding dress selection process. The call was put on speaker, so Sarich was able to overhear their discussion. When McGowan asked “how much” the dress was, Sarich proceeded to shout angrily in response. It’s uncertain if the couples are still together as simply browsing through their social media profiles doesn’t indicate much, but Newsweek reached out to WE for comment on this. Season 12 of Bridezilla will be comprised of 10 episodes. The show was renewed following the debut of a successful reboot in 2018. Bridezillas airs Fridays at 10 p.m. ET on the WE network.